[133 Pages Report] MarketsandMarkets expects the global law enforcement software market size to grow from USD 10.00 billion in 2017 to USD 18.13 billion by 2023, at a Compound Annual Growth Rate (CAGR) of 9.3% during the forecast period. The forecast period is from 2018 to 2023, wherein 2017 is the base year for estimating the market size. The major objective of this report is to define, describe, and forecast the law enforcement software market by component, solution, service, deployment type, organization size, and region. The report provides detailed information related to the major factors (drivers, restraints, opportunities, and industry-specific challenges), influencing the market growth. The report forecasts the market size with respect to 5 key regions, namely, North America, Europe, Asia Pacific (APAC), the Middle East and Africa (MEA), and Latin America. The report profiles the key players and comprehensively analyzes their core competencies. 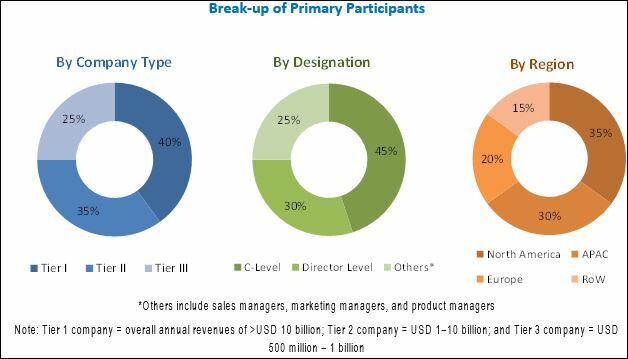 Moreover, this report tracks and analyzes competitive developments, such as mergers and acquisitions, partnerships and collaborations, new product developments, and enhancements activities, in the market. The research methodology used to estimate and forecast the law enforcement software market began with the collection and analysis of the data on the key vendors’ product offerings and business strategies from the secondary sources. These secondary sources include Information Technology (IT) services providers, technology providers, press releases, investor presentations of companies, white papers, technology journals, certified publications, and articles from recognized authors, directories, and databases, such as D&B Hoovers, Bloomberg Businessweek, and Factiva. Moreover, vendor offerings have been taken into consideration to determine the market segmentation. The bottom-up procedure was employed to arrive at the total market size of the market from the revenue of the key market solutions and services providers. After arriving at the overall market size, the total market was split into several segments and subsegments, which were then verified through the primary research by conducting extensive interviews with key people, such as Chief Executive Officers (CEOs), Vice Presidents (VPs), directors, and executives. Major vendors in the law enforcement software market include IBM (US), Accenture (Ireland), Oracle (US), Motorola Solutions (US), Axon (US), CyberTech (India), Nuance Communications (US), Esri (US), Palantir Technologies (US), eFORCE Software (US), Wynyard Group (US), DFLABS (Italy), ARMS (US), PTS Solutions (US), Hexagon Safety & Infrastructure (US), CODY Systems (US), Column Technologies (US), Cyrun (US), Incident Response Technologies (US), Numerica Corporation (US), Diverse Computing (US), Omnigo Software (US), Alert Public Safety Solutions (US), CAPERS (US), and BlueLine Grid (US). Community-oriented policing is a strategic move adopted by law enforcement agencies, and this enables them to work closely with the community and improve the members’ quality of life. Communities play a key role in defining their own security and safety needs, and community-oriented policing encourages citizens and law enforcement officers to establish a healthy partnership and prevent future crime incidents. For the past few years, there is a rapid increase in the adoption of community policing methods laid by law enforcement organizations in the aim to increase the effectiveness of the police force in preventing and responding to crime incidents. Therefore, this factor is expected to act as a driver for the adoption of law enforcement software. Moreover, the increased focus on community-oriented policing allows law enforcement professionals to solve crimes and prosecute criminals at a faster pace. Smart technologies are revolutionizing the structure of cities. Smart technologies such as smart energy meters, security devices, smart appliances, and smart transportation are being used to develop many smart cities. Integrating the right level of data and law enforcement software solutions is very important. The increasing crime rate has forced the government officials and law enforcement organizations to enhance the public safety infrastructure using smart technologies. The governments are rapidly investing in various sectors, such as smart homes and buildings, smart transportation, smart utilities, public safety, and connected cars. For instance, the Australian Government awarded USD 2.58 million to the Victoria Council for the development of public safety and security infrastructure to improve the community’s safety at public places. Law enforcement agencies around the globe are keenly focusing on intelligence and security. Intelligence provides law enforcement agencies an effective way of solving crimes. On the other hand, security ensures that crucial data does not fall into the wrong hands. The surveillance carried out by law enforcement authorities helps gather massive information about a crime or the criminal activities before their occurrence, in turn helping with establishing the occurrence of the crime. Law enforcement software solution providers must adhere to government compliances and regulations, such as General Data Protection Regulation (GDPR) in Europe and Criminal Justice Information Services (CJIS) in the US to provide appropriate controls for protecting crucial information, as these software are used for managing personal information and help law enforcers in investigation, detection, or prosecution of criminal offences. The phase of technology innovation is accelerating year-over-year. IoT-based connected devices are generating huge amounts of information more than ever before. This information can provide actionable insights into solving and preventing critical infrastructures from crimes. Big data and data analytics technologies can yield valuable insights from the data available. Data analytics is the concept in which one can gain valuable insights into historical data. Big data analytics is also a similar concept, where huge amounts of data, immaterial of whether it is structured or unstructured, can be analyzed. The data generated from various security devices is first cleaned and managed, so that it would support pattern recognition and identify anomalies, and this would help law enforcement agencies in identifying the criminal suspect and preventing further crimes easily. Advanced big data analytics’ capabilities are now integrated with various CCTV surveillance systems in a country to improve the response times to crime incidents. With recent advancements in technologies, especially in virtualization, cost-effective and efficient cloud-based solutions have made significant impacts on organizations. Law enforcement agencies are keen on embracing new age technologies and going digital. The security of sensitive data has always been a concern for law enforcement agencies, and reasonably, this has been the primary inhibitor for adopting cloud solutions. Modern criminal investigations result in the gathering of large amounts of electronic data and keeping this information accessible in an increasingly mobile environment would create opportunities for the law enforcement software vendors to deliver tailored solutions to law enforcement agencies. Mostly, big law enforcement agencies already have the IT infrastructure and the highest levels of expertise and resources to manage crucial data. However, small and medium-sized law enforcement agencies have limited budgets. Besides the price of the IT devices, there are significant expenses for adopting on-premises solutions, including IT overhead expenses. Cloud-based law enforcement solutions would, therefore, act as an opportunity for law enforcement agencies in increasing the reliability and accessibility, and offer security from ransomware attacks. Law enforcement agencies are incorporating various digital solutions, such as high-quality video surveillance, body-worn cameras, and in-car cameras, to provide reliable evidence against the conviction of criminals. Body-worn cameras provide various public safety benefits, while they also create various public safety challenges, such as data security. For instance, the US-based law enforcement agency, Seattle Police Department, generates more than 360 terabytes of data from the dashboard cameras alone. Moreover, the police department in Duluth (a city in Minnesota, US) was able to afford USD 5,000 to purchase cameras, yet struggled with spending USD 78,000 toward data storage fees, just for 2 years. Furthermore, as per the Motorola 2016 Law Enforcement Survey Report, around 85% of the respondents wanted more multimedia capabilities for investigating criminal activities. In today’s digital and connected world, massive amounts of data is being processed and transferred constantly. With the increasing number of criminal incidents, the efficient and effective analysis of criminal justice data is critical for the law enforcement personnel to perform investigations and fight against crimes. It becomes a challenge for law enforcers to extract meaningful information from the data available in a variety of data formats and maintain it in a structured manner in several government data centers, so that it can be accessible to law enforcers for future references. Many agencies face significant technical and resource challenges in exploring, analyzing, and using the data to prevent crime and threats, including terrorism, incident response, and cybercrimes. Numerica Corporation launched Lumen Dynamic Scoring Agent to help law enforcement agencies in scoring and ranking criminals based on their past involvements in events using live data updates. Axon launched Axon Fleet 2, its second generation in-car video system, to cater to the specific requirements of law enforcement professionals. The product included high-definition video system with better zoom, infrared for the back seat, and wireless microphones, which enable law enforcement professionals to securely share critical video evidence. Motorola Solutions acquired Avigilon. This acquisition would help improve end-to-end security platforms that include high-quality video surveillance system and AI-based analytics required by law enforcement agencies. Axon, formerly known as TASER, acquired Dextro and Misfit to build an AI group, Axon AI. This group accelerated the AI-based analytical capabilities of Axon. Axon partnered with Milestone Systems, a leading provider of open video management software, to help law enforcement agencies analyze and store massive volumes of digital data, such as photos and videos. Axon partnered with DJI, the world's leader in civilian drones and aerial imaging technology, to provide DJI drones to more than 1,500 public safety and law enforcement agencies and accelerate the Axon Air program. 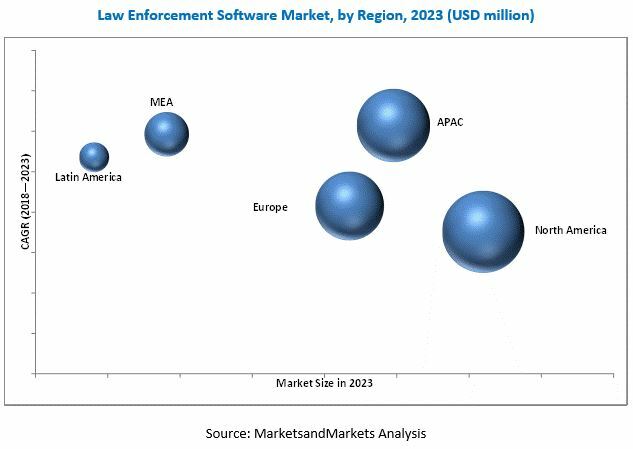 MarketsandMarkets expects the global law enforcement software market size to grow from USD 11.64 billion in 2018 to USD 18.13 billion by 2023, at a Compound Annual Growth Rate (CAGR) of 9.3% during the forecast period. Major growth factors for the market include an increasing focus on community-oriented policing, the growing adoption of IoT-enabled products and social media platform, and rising demand for mobile-based law enforcement software. The report segments law enforcement software market by component, solution, services, deployment type, and region. The services segment could grow at a high rate, as law enforcement services help law enforcers in crime analysis and taking proactive measures to prevent future occurrences. In the services segment, the implementation services segment is expected to grow at a higher CAGR during the forecast period. The cloud segment is expected to grow at a higher CAGR during the forecast period, due to the various benefits, such as cost-efficiency, scalability, high computing speed, and reduced expenditure on Information Technology (IT) infrastructure. The law enforcement software market by solution has segments of Computer-Aided Dispatch (CAD), record management, case management, jail management, incident response, and digital policing. Increasing rate of crimes has forced the law enforcers to implement law enforcement software to solve crimes and prosecute criminals at a faster pace. The governments are heavily investing in advanced technologies to take proactive measures and prevent future crime incidents. The law enforcement software solution facilitates incident response and information management, enhances public safety, and supports efficient use of resources and crime analysis, community policing, and the day-to-day operations of law enforcement agencies. The global law enforcement software market report provides a region-specific analysis on 5 major regions: North America, Europe, Asia Pacific (APAC), Middle East and Africa (MEA), and Latin America. North America is estimated to be the largest revenue-generating region for law enforcement software solutions and services providers in 2018. The region is an early adopter of new and emerging technologies, thereby witnessing a significant growth of the market. APAC is expected to be the fastest-growing region in the market, due to the technological advancements, digital transformation initiatives to automate the overall investigation process, increasing awareness among government agencies to leverage benefits of law enforcement software. The varying structure of government compliance and regulations may hinder the growth of law enforcement software market. *Details on Business Overview, Solution, Key Insights, Recent Developments, SWOT Analysis, MnM View Might Not Be Captured in Case of Unlisted Companies.